Resting peacefully on the shores of Damai Beach, this tropical resort boasts a serene and breathtaking natural surroundings. Merely 30 kilometers from Kuching and 40 kilometers from the Kuching International Airport, Damai Puri Resort & Spa can be easily accessed. Simply minutes away from the well known Sarawak Cultural Village, which hosts the annual World Rainforest Music Festival, guests will definitely have a good time. Bako National Park, Satang Island, and Santubong River are fascinating natural attractions you should visit during your stay. Damai Puri Resort & Spa houses 207 guest rooms and suites that feature exceptional 4.5 star amenities to ensure a lavish stay. Luxuriate in facilities like the 5 signature restaurants and bars, 2 exceptional swimming pools, state-of-the-art gym, outdoor tennis court, children’s club, first class ballroom, 6 meeting rooms, and even a private beach area exclusively for the hotel guests. Perfect for those who want a romantic getaway, pamper yourself with a therapeutic spa treatment from the D’Puri Spa Village. 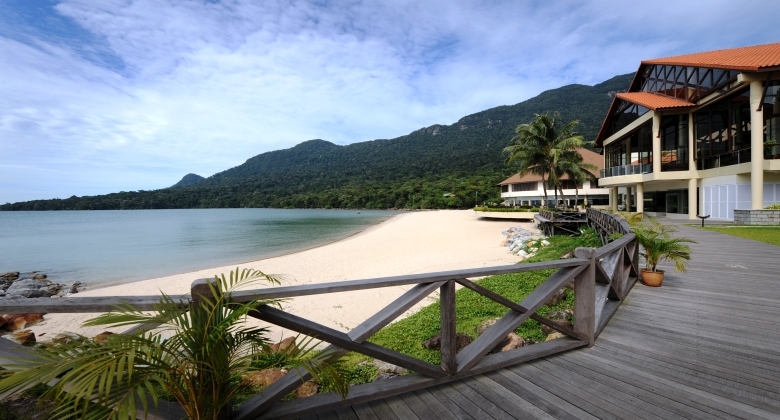 Damai Puri Resort & Spa is a panoramic escape and an ideal vacation destination in Malaysia.